The California Primary as refracted through The Financial Times and The Washington Post. 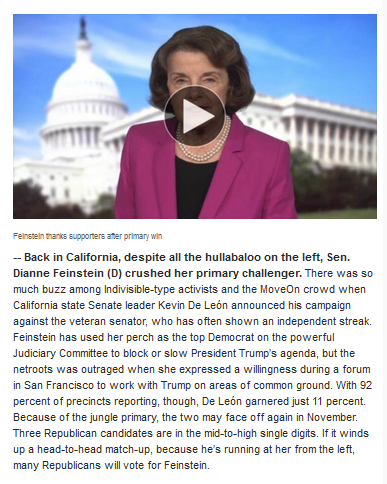 The California Primary was about the same old New Democratic hacks, the utterly vile Feinstein, the erstaz Anti-Trump poser, return. With the addition of Newsom, who has a built-in edge in the LBGTI Community, for his performance of marriages, in the state before it was actually legal. Some of us Queers are grateful, and some found it grandstanding! But it was the adroit exercise of the lifeblood of politics ‘Public Relations’ as the Madison Ave. and Hollywood hacks call their propagandizing. If you read and used the California Statewide Direct Primary, the official guide that all voters use, you’ll see that neither Newsom nor Villaraigosa bothered to place the usual candidate statement in this guide. Even Feinstein managed to post her exercise in self-congratulation, along with a carefully re-touched black and white photo. The big question is why? Villaraigosa is a compliant New Democrat, as is Newsom. Villaraigosa immediately endorsed Newsom after his defeat. The ads I saw from Newsom were focused on his opposition to the NRA, featuring his status as the brave opponent of this powerful advocacy group. The usual political kitsch, communicated by video of Newsom striding through crowds of supporters, shaking hands with the lesser beings that he seeks to lead, and the obligatory shots of his encounters with the children of those lesser beings, and quick photos and videos of him performing those marriages. In sum, the Villaraigosa candidacy supplied the the fiction of contest.